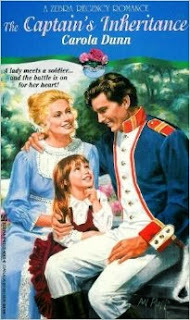 In my first post for Blood-Red Pencil, I mentioned that I have been writing Regency romance for 35 years. In that time I've seen some interesting, and head-scratching, decisions by various art departments, particularly on the foreign translations of my books. It seems certain concepts just don't translate very well. 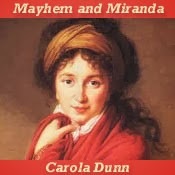 Left is the original paperback cover for Mayhem and Miranda, a Regency about a penniless companion to an eccentric lady, and below right is the original ebook cover. Totally misleading is the cover to the Hebrew translation (below center). Unless they drastically altered the text in translating it, the image has nothing whatever to do with the story. Anyone buying the book expecting a bodice-ripper would be sorely disappointed. What's more, they spelled my name--I'm told--"Carol Deen". The cover for His Lordship's Reward is cute: the three-year-old, black-haired like her Spanish mother, is adorable. Its sequel, The Captain's Inheritance, takes place about three months later. In the meantime the darling little girl has aged by five years or so and bleached her hair. The ebook cover, though, is perfect. I was browsing in a thrift shop in England when I found a print of an artillery officer of the British Army in the Napoleonic era. 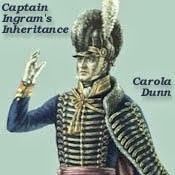 That's what Captain Ingram is. My Regency ebook publisher used it, so this is just right. But it's the cover art for my Daisy Dalrymple series that has had the most bizarre personality shifts. The boxed set of the Polish edition is very cleverly done, with the spines of the volumes producing a cat that strongly reminds me of the Pink Panther. The same cat adorns all three front covers that I've seen. Except that I can't remember ever writing about a cat in any of the Daisy books. There may be a casual mention somewhere in the 21 I've written to date, but I'm a dog-person and so is Daisy! 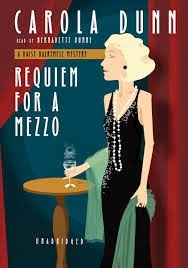 Speaking of Requiem for a Mezzo, the English versions have the distinction of being the most misleading of the Daisy covers. From the cover on the left wouldn't you reckon the victim was a blonde in a red dress? 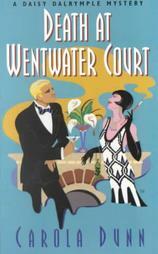 Or, according to the UK edition (below right), a brunette in a blue dress? The audio version thinks it was a blonde in a black dress (below left). My mother, for one, kept switching between text and cover of the first one, thoroughly confused because it's actually a blonde in a blue dress. So, don't ask a (traditionally published) author why the cover doesn't fit the book. It's usually not his/her fault! Fascinating look at cover variety. My small press publishers pretty much said, "If your name is spelled right, we're not changing anything." This is only a very small sample of Covers I Have Had. 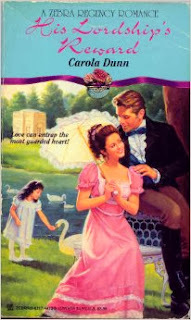 My very first book (Regency), Toblethorpe Manor, has moorland covered with blooming heather to show where the hero found the heroine lying in the snow...; the one where it looks as if the hero is trying to break the heroine's arm; the UK editions of Daisy persisting in giving her black hair; the original US hc of The Case of the Murdered Muckraker--they actually used a real 1920s photo of NY, where much of the story takes place--for once they showed it to me beforehand--all muddy sepia tones, so I asked if they could brighten it a bit: Result, bright orange. Holy Mary, that's one of the funniest posts I've ever read. Carola, you have an astounding sense of humor to deal with this the way you do. A good example for the rest of us. LOL. I'm guessing your publishers keep you in part because you are so easy to work with. You think? LOL! Seriously, I have known at least one good writer who had a series cancelled because she was hell to deal with. Probably the most extraordinary encounter I've had with cover art was the original US hc of Rattle His Bones. It takes place in the London Natural History Museum. They dug up a real photo of the huge (and fake) dinosaur skeleton which occupied the big hall. Very nice, but there was something else in the photo that completely gave away a major plot point. An extraordinary coincidence! Thank goodness they showed it to me before it was too late to airbrush out that revealing... Well, I won't tell you what it was in case you read the book. I should add that my editor hadn't noticed anything amiss! Wow! I've heard stories like this often. I'll be curious to see what people think of the new covers for my series when it's released in May. I disagreed with my new publisher/designer about two of them, but they won! They have more sales & marketing experience, so I'll see how this goes! Very interesting post, Carola! What an epic journey your covers have had. :-) You would think that the publishers would pay more attention to what is in the story when they design the covers, but then, many don't think past the marketing. I'm a firm believer that a cover should obviously represent some part of the story. The cover on my first book didn't, and it's being redesigned and the book reissued. Probably the worst nightmare is when you have no control over cover image, then readers complain to YOU because something is amiss. What do you do? Shrug and say, "thanks, I'll pass it on to my arse... er, I mean, editor." LOL. Another Daisy one that I managed to get changed in time--Dead in the Water. It's set in Henley on Thames, a small town 35 miles from London. So why did the art dept decide the cover needed St Paul's, Tower Bridge, the Houses of Parliament etc? When my editor asked, he was told "To show it's set in England." The fact that it was the 6th book in a series ALL set in England seemed to have escaped them. I also liked the cover for the paperback of "Crossed Quills", where the hero is consistently described as blond, and on the cover he's dark. Someone said the arms of the h/h on that cover are too long! Otherwise, it's one of the better covers, hair colour excepted. 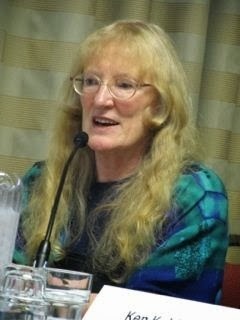 Come to think of it, Crossed Quills is about editing, among other subjects!